The park office is located at 395 Rich’s Dugway, Rochester, NY 14625. The main entrance of this park is located east of route 590 on Blossom Road in the Town of Penfield. Ellison Park is open daily 7:00 a.m. until 11:00 p.m. and has a Carry-in Carry-out rule, which means you must take all your garbage with you for disposal after leaving the park. Amplified music is not allowed at the South Lodge or the Island, Spruce, Circle and Sycamore Shelters. This park has four enclosed lodges and six open-air shelters including a premium lodge, the Pavilion Lodge! Officially the first Monroe County Park, Ellison Park came into being in December of 1926. The county accepted approximately 200 acres of land from Mr. and Mrs. Frank T. Ellison in memory of Mr. Ellison’s father, Nathaniel. 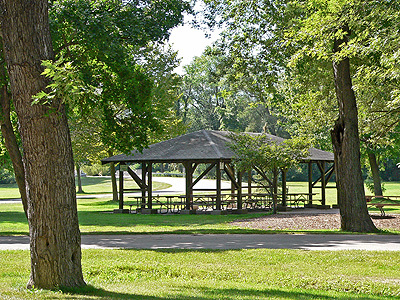 Ellison Park has been the hub of many historical events and locations. Indian Landing which was located on Irondequoit Creek, for many years was used by the indigenous Iroquois as the beginning of the portage route which stretched along Ellison Park. The Lost City of Tryon, originally founded in hopes of creating a commercial settlement, used the Irondequoit Creek for trade. A store was built that bartered with the Seneca Indians, beginning its trading roots. There are four restrooms located in the park. There is one located by the Disc Golf Course off Landing Road (open seasonally between May 1st and October 31st). There is another behind the Hazelwood Grove Lodge. Another facility is located by the Creekside Lodge. The last restroom is located by the Sycamore Shelter (open seasonally between May 1st and October 31st). All of the restrooms have flush toilets. See the park map for specific locations. Before heading out to Ellison Park print the park map. The color coded hiking trails and additional details will keep you on the right track. Coyote Den Trail, this 1.1 mile walk (one way) passes by a few ponds and walkers can expect to see many birds and other wildlife. Overlook Trail, this .6 mile walk overlooks Thomas cove and the stone quarry. Mill Race Trail, this .4 mile walk, shows the stages between wetlands and a forest. Indian Landing Trail, this 1.5 mile walk, is full of history, from the location of an old trading post (Fort Schuyler), to the presumed famous Butlers’s Rangers hideout, marked with commemorative plaques. Butlers Gap Trail, this .7 mile walk (one way) has many interesting historical features as well as an intersection that overlooks the wetlands. 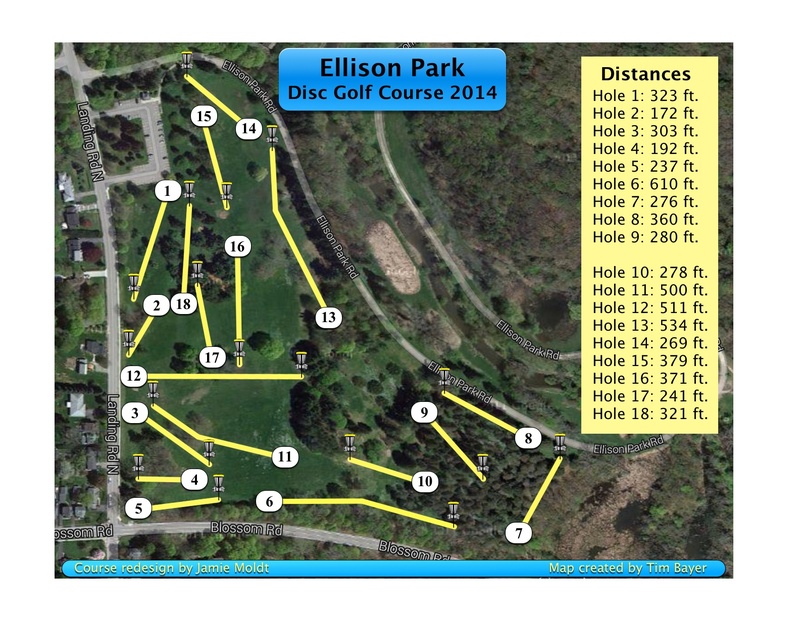 A new Disc Golf map can be found here. The Greater Rochester Disc Golf Club worked very hard with the Parks Department to re-route the course. Disc golf is open for play from approximately early/mid April until mid-November, dependent upon ground conditions and weather. If you've never played before, there's never been a better time to get out early and learn. Contact the Greater Rochester Disc Golf Club at www.grdgc.org for more information about the sport. There is one playground facility in Ellison Park. It is located on the north side of Blossom Road, near Roadside Shelter. See the park map for the specific location. Ellison Park has five softball fields and one multi-use athletic field that are available for rent. Click here to request a field reservation online or call 585 753-PARK (7275) for more information. ​The five softball fields are located throughout the park; #1 and #2 are near Circle and Sycamore Shelters; #3 and #4 are along the road leading to the South Lodge, and #5 is by the Old Meadow Shelter. There are also 3 tennis courts that are lined for Pickleball, and one court lined only for Pickleball. These courts are located off Blossom Road. Ellison Park offers two designated sledding hills, and an ice skating rink. The sledding hills are located off Landing Road by the Disc Golf Course. The ice skating rink is located in the large parking lot off Blossom Road. There are no skate rentals; you must bring your own. There is no warming hut available nearby the rink at Ellison Park. Fishing is allowed in Ellison Park as long as those fishing are following NYS Department of Environmental Conservation guidelines and rules and have the required licenses. There is a non-motorized/car-top Boat Launch located on the south side of the park, near Circle Shelter.